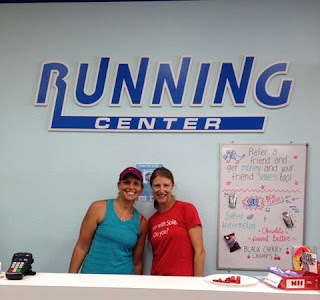 Runs with Sole: Where I get my stuff! I took a break from blogging last week. It was an especially stressful week and, unfortunately, blogging had to take a back seat. I'm sorry I was unable to share my pearls of wisdom ;) But I'm back! And it's Tuesday, which means it's Tuesdays on the Run time! This week, we're sharing where we like to get our running gear. Before I continue, just wanted to give a shout out to the Tuesday on the Run blog link up hosts, My No-Guilt Life, MCM Mama Runs and Marcia's Healthy Slice. When you're done reading here, go check them out! Typically, I'm a local running store lover. I like to shop local for two main reasons: I like to try stuff on (or at least see it person) and I like to support local businesses. Here in the San Diego area, I usually shop primarily at my favorite store, the Running Center in Carlsbad (there is also one in Temecula). The people there are amazing (this so happens to be where I met my BRF, Vanessa) and they go above and beyond the call of duty to get you what you want. The staff is very knowledgable and will do their best to help you. I send all my local clients there. I've also had the privilege to coach a few running programs through the store as well as participate in a few of their events. They are a great resources for people of all abilities, runners and non-runners alike. They have a rewards system that really adds up, rewarding you with gift certificates based on the amount you spend in the store. You earn 10 points for every dollar you spend and they award gift certificates when you reach a 2,500 points. And you can actually earn additional points when you shop at other retailers online. It's really cool. They also have amazing sales, including one for Mother's Day this weekend. One of the first photos of me and my Vanessa! I also really like Movin Shoes. I mainly go to the Encinitas store but I've been to the Pacific Beach store as well. Everyone is always very nice and very knowledgable. They also happen to have an Olympian (Meb Keflezighi, of course) as part-owner. Movin Shoes has great events, often has fluids and nutrition out along the 101 for runners and is a great local resource. I've had the pleasure of hosting nutrition talks with them and they've always been great to work with! I do also shop online at times. I get my Ink n Burn online through their website, but Running Center also carries a lot of their stuff (which is how I first discovered the brand). But I have also shopped at Running Warehouse, which is a great online resource when I can't find what I'm looking for locally. They often have really good sales on older models of shoes and you can usually find coupons online or on their Facebook page. And they often throw stuff in for free such as a reusable grocery tote, stickers or other items. I typically get my hydration online through Skratch directly or I pick it up at REI. I usually make my own food, but if I'm in a bind and I want something other than pretzels, I'll pick up something like the Skratch fruit drops or Clif Bar organic purees at REI as well. And if you buy a case of their product, they'll give you a discount (I can't remember how much, I think 20%). And if you join REI's member rewards program, you'll earn points that also turn into gift certificates. They do add up! Where do you buy your gear? Are you an online shopper or do you need to buy your stuff in-person? Or both? I'm very much an online shopper, and have found a lot of good stuff recently on ebay. Huh, I've never thought to look on ebay. I'm going to check it out! You've got a good lookin crew there! Nice to have a local option like that- a real community. I feel really lucky that we have so many local running stores. It really does build a great community. It seems everybody shops at Running Warehouse! I'm going to definitely give them a try! Local running stores are the best! They really are! When we were looking for houses (we were relocating from the east coast), finding the local running stores was one of the first things we did! I like this topic this wk. I found several great online stores to shop at. Great pic of you and your running gals! Thanks! Yes, this was a fun topic and I definitely learned of some new resources. Facebook keeps placing Ink N Burn ads on my feed just about every day. Perhaps I talk about my running gear a lot? Because I live in the middle of nowhere NH a lot of my shopping is online although we do have some fun local retailers but not many that have tons of running gear. I wish we had some better running specific stores. I love Ink N' Burn. How great that you have a local store that carries it! Yeah, we're pretty lucky to have our share of good specialty running stores. Especially one that carries InkNburn! !